From the Glider Rocker to the Finish Line: My Quest for a GOOD Breakfast! It seems these days I am constantly on the hunt for a healthy protein rich breakfast for the whole family. The catch is it has to be easy to prepare too - and preferably not just a bar in a wrapper. My kids like cereal (thankfully whole grain) and oatmeal, but still, no protein. My family also LOVES eggs, but except for the random weekend morning here and there, who has time for that? Well, I think I found a way! I found a great recipe at one of my favorite cooking sites Once a Month Mom. If you are at all interested in easier healthy recipes that are great for making in large batches so you can freeze meals ahead, Once a Month Mom is a great resource. I didn't follow their recipe exactly because when I decided to try it for the first time, I did not have all the ingredients. So, here is what I did: I had nine eggs, I used 5 whole eggs and four egg whites. I beat all the eggs together (whole and egg whites) and added ham (a family favorite). I did not add salt or pepper because, in general, our family rarely uses salt or pepper. 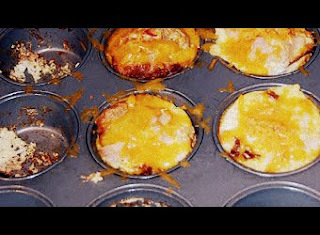 I used a standard size cupcake/muffin pan that makes 12 muffins. I sprayed nine of them with cooking spray and placed roughly one third of a slice of whole wheat bread in each. I filled the nine cups with the egg/ham mixture. I baked them as recommended in Once a Month Mom. I topped each one with roughly a tablespoon of shredded cheddar cheese (full fat, we don't skimp on milk fats in our family - we cut fat in other areas). Once they cooled a bit they were pretty easy to pop out with a fork and were delicious. The only thing I would change is the red pepper would probably be very good, and I might add a bit of salt. I froze the leftovers in individual plastic containers and they reheated in the microwave very well - a great breakfast for after a workout. So each "egg muffin" had one half a whole egg, one half an egg white, perhaps 1.5 oz of ham (probably less) and 1.5 tablespoons of full fat cheese. I haven't gone to figure out weight watchers points, but I would venture a guess they would fit quite well into that program. I pair the egg muffin with fruit or yogurt to round out my after workout breakfast. At some point I will have to fill you all in on my "two breakfast" mornings that seem to work really well for me. I would LOVE to hear other good healthy and protein rich breakfast ideas from any of my readers! Please, share! Honestly, for myself, I tend to eat half a turkey sandwich - but the family just can't get their heads around a sandwich like that for breakfast! That sounds yummy Lisa! I am going to have to try it. Ha! Leslie, you have it way more together than I do in the morning if you can actually cook something in a pan on the stove! I need your help developing a better morning routine! Lisa, I don't always have time to do that, but when I do the omlet, the whole process only takes me 10 minutes (including the eating). Other mornings i do non fat greek yogurt with fresh fruit when I get to work. Or oatmeal in the microwave at work, but that is less protien.